Bridging the gap between the long bones of the forearm and the proceeding bones of the digits there is a fertile land of great mystery and intrigue, otherwise recognised as the wrist. The mammalian wrist is formed of a series of globular, tessellating bones called the carpals, forming two rows. 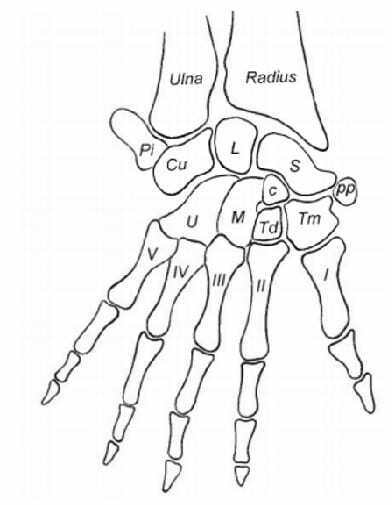 Those comprising the bottom row are the Scaphoid (S), Lunate (L), Triquetral (or Cuneiform, Cu) and Pisiform (Pi); along the top are the Trapezium (Tm), Trapezoid (Td), Capitate (C) and Hamate (H); often there are an extra two bones thrown in as a bonus: a tiny bone below the thumb called the Prepollex (pp), and an intermediary bone in the centre of the wrist called the Centrale (c). The standard mammalian wrist, including labelled carpal bones. Image from Lewis (1989). Although relatively unstudied until recent years, the shape of carpal bones tend to provide a wealth of information relating to the ecology of the species in question, since the forearms tend to do a lot of the work an animal undertakes during its day-to-day routine. A fossorial (burrowing) animal, such as a mole, that spends most of its free time digging about in the soil tends to have a tougher and squarer set of carpal bones, thus helping resist pressures caused by the strong earthen substrate. Whereas carpals generally appear more curved and smooth in the case of species that require a large amount of dextrous movement, like gibbons and other arboreal (tree-living) primates, who tend to enjoy doing a good swingy-swingy. 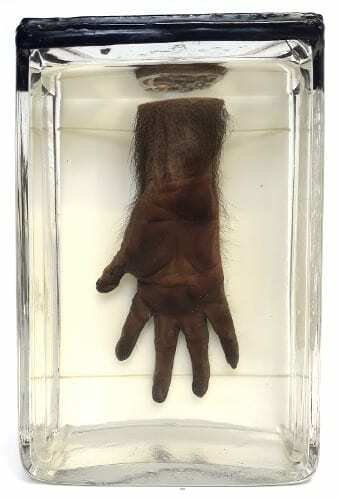 The chimpanzee wrist is comprised of eight carpal bones, having lost the prepollex and centrale, the remaining majority of primates tend to have the full set of ten. Naturally the chimpanzee wrist shares a great deal of similarity with the human wrist, owing to our intimately close ancestry. Both of us have smoothed and highly grooved carpals, allowing extensive rotation and flexing, an essential condition needed for arboreal climbers. While chimpanzees do climb, they tend to be terrestrial and express a mixture of bipedal stances, often ‘knuckle-walking’ by walking on all fours with their wrists extended. Both ourselves and chimpanzees almost certainly have our complex carpal bones to thank for part of our developments in tool usage, since they allow the freedom of movement needed to carry out complex and dexterous tasks. 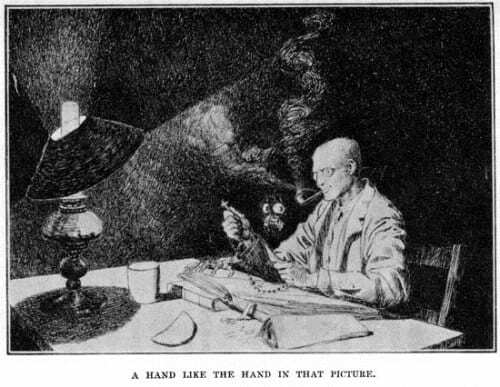 Illustration from Canon Alberic’s Scrap-Book, unknown to Dennistoun, a hairy hand lies next to his own. Image is in public domain, author James McBride, taken from Ghost Stories of an Antiquary, M.R. James (1904). It was this exact line that surfaced in my head as I spotted this lonely hand peering out from behind the darkened shadows of the museum. It’s human similarities briefly hint towards the uncanny; perhaps M.R. James simply drew his inspiration from the haunting elements of the natural world that are all too easy to stumble upon. -James, M.R. (1904). Ghost Stories of an Antiquary. Edward Arnold & Co, London. -Lewis, O.J. (1989). Functional Morphology of the Evolving Hand and Foot. Oxford University Press, New York. Rowan Tinker is the Museum Intern at the Grant Museum of Zoology, UCL.